Have you ever heard about keen joint replacement or knee replacement which is also called knee arthroplasty? In this article, I am going to discuss about knee joint replacement, its types, risks, and benefits. This article is for information purpose. You must consult the doctor before considering about the knee joint replacement. What is knee joint replacement aka knee arthroplasty? A surgical procedure to replace a knee joint with a man-made artificial joint with the aim to decrease pain and improve the quality of life of a patient. 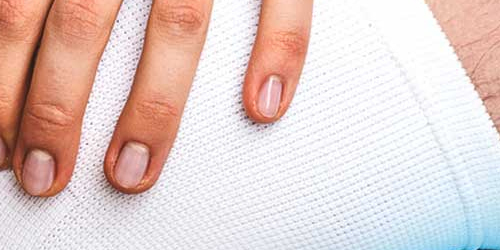 The artificial joint which is used in keen replacement surgical procedure is called a prosthesis. The surgery is recommended for people who are suffering from severe knee damage. A successful knee joint replacement can relieve the pain and allow the patient to be more active. Knee replacement is recommended by doctors or surgeons to a patient having knee pain is not getting benefits with medications and other treatments available. Broadly speaking, there are two types of knee replacement. In total knee replacement, the surgeon eliminates damaged cartilage and bone from the surface of the patient’s knee joint completely and then substitutes them with a man-made surface of metal and plastic. Unconstrained bicompartmental knee replacement is the most common form of total knee joint replacement. In traditional total knee replacement, surgeons make 7-8 inch incision over the knee of the patient. The patient may need 3-5 days of hospital stay and a recovering period of one month to three months. Successful total knee replacement surgery results in complete relief of patient’s arthritic symptoms. In a partial knee replacement, aka called unicompartmental knee replacement or unicompartmental knee arthroplasty or UKA, the doctor/surgeon replaces only one part of a patient’s knee joint. The surgical procedure involves replacements of the medial compartment only with components like osteotomy and osteoarthritis. UKA is not suitable for the patients with rheumatoid arthritis (RA). In partial knee replacement, surgeons make a smaller incision than of the total knee replacement. As a result, a person may also have a smaller scar. It is the best part of about UKA. Since the surgeons make a smaller incision, the patients may experience less post-operative pain on account of less bone is removed. Knee joint replacement surgery can cause blood clots also known as deep vein thrombosis. It is the most common complication after the surgery. The doctor may prescribe certain medications to help prevent deep vein thrombosis also called blood clots. Other risks may include obesity (people going through total knee replacement), weakness, nerve damage, scarring, stiffness, persistent pain, fractures, loss of motion, instability, etc. Knee joint infections, which are also called infectious arthritis or septic arthritis, may also occur after knee replacement surgery. In this case, a patient needs emergent medical attention or sometimes surgical attention. These infections must be treated promptly. If ignored, knee infections can cause rapid damage to the knee joint. 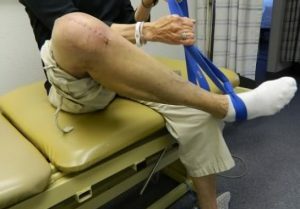 So, patients must not hesitate if they have symptoms of knee infections like severe pain, joint swelling, joint warmth and inability to walk, loss of motion or gain of weight. The patient will no longer be able to do certain activities such as jogging and high-impact sports after a knee joint replacement surgery. The quicker operation, shorter recovery period, reduced blood loss during surgery, less time spent in the hospital, and fewer costs are some of the potential benefits of a partial knee replacement or unicompartmental knee arthroplasty. 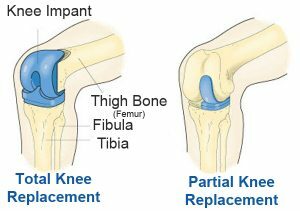 Irrespective of whether it is a total knee replacement or a partial knee replacement surgery is done potential benefits of both types of knee replacement are the same. After a successful surgery, more than 90 percent of patients experience substantial or complete relief of knee joint pain and greater mobility. They can walk without a support of a cane or stick. They can walk without bending. In the most successful case, it becomes impossible to identify that a person has gone through total knee replacement surgery. After a successful knee joint replacement, patients can enjoy reasonable recreational activities like traveling, swimming, golf, dancing, etc. But people must care about what is suitable for them. They must consult their doctors before opting for any physical activities. What can happen without knee replacement and who should consider it? Many people don’t like knee replacement because of its possible risks. But in severe cases, a patient must consider for it after consultation with a renowned doctor/surgeon. Arthritis is not a common fever or cold. It is often progressive and chronic symptoms of pains in the knee. It gets worse over the time. There can be a reasonable number of non-operative interventions such as medications and other treatments to get relief from knee pain before considering any type of knee joint replacement surgery. Prior to surgery, a patient must go for medications including oral or injections. But when medications and other treatments are not helping the patients in decreasing their knee pains then they must consider for knee replacement. Yes, a patient may need physical therapy after the knee joint replacement and get discharged from the hospital. Most surgeon will recommend for it. Physical therapy after knee joint replacement is good and highly effective in quicker recovery. A patient can do either home physical therapy or do the same at the therapy centre. There are several knee joint replacement surgeons or orthopedic doctors in Delhi. Dr. Ashish Jain is one of the renowned names who is significantly helping people who are suffering from joint pains like knee pains, shoulder pain, hip pain, etc. He is one of most recommend joint replacement surgeons in Delhi when it comes to knee joint replacement, shoulder replacement, and total hip replacement. If you are looking for the best knee joint replacement surgeon in Delhi then you may visit Dr. Ashish Jain’s Knee Clinic located in Shalimar Bagh, New Delhi. He has a great team that cares and ensure for the best solutions.